The Helmet Heat Ice Reduction System should only be installed by trained and certified Gutter Helmet dealers. 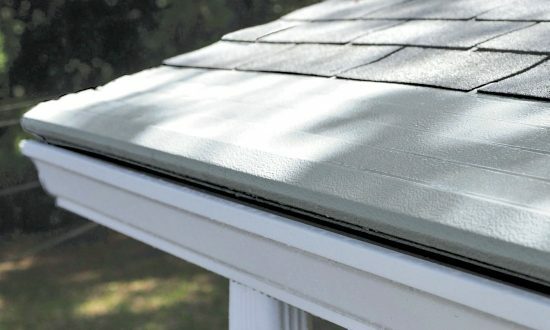 Different hardware and configuration options are available for Helmet Heat, so talk to your local Gutter Helmet dealer about the best setup for your home and for the weather conditions typical of your area. Your contractor will plan the circuits and take measurements according to your installation requirements. Three factors will be determined before installation, two of which should be discussed between you and your contractor. The third depends on the size of your gutter system. The first thing to consider is where the power will be located. Because Helmet Heat’s electrical junction box is weatherproof, it can be placed in any exterior location. Common locations are near the gutter downspout at the base of the home, allowing the power to be supplied through a crawl space or basement. The heat cable will run up the downspout. Another common junction box location is just below the roof eave. The power supply line can be placed inside the attic near one end of your gutters. Some installations require only two lengths of heat cable: one under the gutter cover, one down the downspout. But for areas that experience very heavy snowfall, a three-wire setup is recommended. Your contractor will advise you on the best setup for where you live. In either setup, the system will consist of one continuous length of heat cable. The wire will run from the power connection box to the end of the gutter system. If your gutters are longer than 450 feet, additional power boxes will need to be installed and the cables continued from that point on until the end. Once again, your contractor will advise you on the best configuration for your home. The heating cable’s outer jacket is progressively marked in linear foot increments, allowing the contractor to confirm the total cable length for each circuit at the head and tail. A licensed electrician will connect the heating cable to the power source, per local and national electrical codes. Ground fault equipment protection will also be used for each circuit. For product inquiries and service requests, contact your local Gutter Helmet dealer. You can also fill out our online form or call (800) 824-3772 today to schedule a free Helmet Heat estimate.